When it comes to keeping you and your family’s teeth healthy, it is important to properly brush and floss, but also monitor what goes in and out of you and your families’ mouths. When it comes to keeping you and your family’s teeth healthy, it is important to properly brush and floss, but also monitor what goes in and out of you and your families’ mouths. The average American consumes 22 grams of sugar per day, which is double the recommended daily amount. Consuming such large amounts of sugar can lead to a variety of dental problems, including gum disease, bad breath, tooth decay, and dental cavities. Sugary drinks, such as fruit juices and soft drinks, are among the worst beverages to consume for maintaining healthy teeth. Although these drinks are the go-to beverages for many children, they are not the best choice. Below are some of the worst drinks for your teeth. Fruit juices are often chosen as an alternative to sugary sodas, but did you know that some juices have as much sugar as the leading colas? In fact, apple juice can have up to 10 teaspoons of sugar per serving, which is the exact amount as the leading brand cola. All of the sugar and citric acids in fruit juice can lead to tooth decay. If you must drink a fruit juice, try lowering the sugar content by diluting it with water. The most well known “tooth rotting” beverage is soda. Sodas damage teeth because of the high levels of sugar acid in them. These high sugar and acid contents can eat away the tooth enamel that protects your teeth, which leads to cavities. 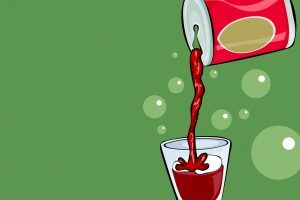 Your best bet is to stay away from sodas all together to avoid exposing your teeth to unhealthy levels of sugar and acid. Many sports drinks contain more sugar than soft drinks, with as much as 19 grams of sugar per serving. Additionally, sports drinks contain an unhealthy amount of sodium. Some of these salt levels can be as much as a bag of potato chips per bottle. Furthermore, sports drinks can eat away at tooth enamel, and can contain high amounts of calories. The best way to minimize the tooth decay caused by consuming sugar drinks is to avoid them at all costs. Consider healthier options to quench your family’s thirst, such as water or milk. If you do let them have an occasional sugary beverage, make sure they rinse with water to flush their mouth and remove any of the sugar that remains. Additionally, they should brush their teeth twice per day for two minutes at a time and floss once per day to remove debris between their teeth. If you are worried that your child is drinking too much soda, or if they are beginning to complain of sensitive teeth that may be related to consuming too many sugary drinks, make an appointment today with your Longmeadow dentist. We will evaluate your child’s dental needs and come up with a treatment plan for a healthy, beautiful smile. Apparatus used to support, align, prevent or correct deformities, or to improve the function of movable parts of the body.